Japan / Australia Tour (1987) The tour ran from 15 November 1987 to 29 May 1988, a large-scale, in-the-round production that toured sports arenas. US/Canada Tour 1 (1989) The first US Tour, a downscaled production directly descended from Broadway, ran in the U.S. and Canada from November 1989 – 12 April 1991. The set included a small loop of track into the audience, and the races were pre-recorded film mixed with live action. 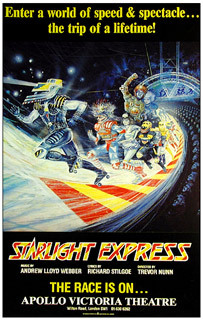 Japan Tour (1990) Starlight Express returned to Japan from 24 March – 18 July 1990 in a revival of the 1987–1988 production. Las Vegas (1993) Opened 14 September 1993 in an abridged, 90-minute production without an intermission at the Las Vegas Hilton, where it ran until 30 November 1997. The show required a massive conversion of the theatre, including pouring concrete ramps into the seating area. Mexico (1997) From October 1997 until April 1998, a Spanish-language production directed and staged by Bobby Love (after Arlene Philips) played at the Teatro Polanco in Mexico City. US Tour On Ice (1997) A completely re-designed production by Feld Entertainment performed Starlight Express on Ice, touring the United States from 6 September 1997 – 1 February 1998. US Tour (2003) Following the closure of the London production, Starlight Express: The Third Dimension, a touring production opened in Biloxi, Mississippi. It was a downscaled and shortened version of the show, with further revisions to the material by American composer David Yazbek. Owing to the restrictions of touring theatres, digital video company Inition were commissioned to produce high-definition race footage in 3-D film to replace the live racing. The show ran from 1 April 2003 until 13 June 2004. UK Tour (2004) The UK Tour of Starlight Express opened on 4 November 2004 in Manchester. Adapted from the second U.S. tour with some reversions to the “New” London production, including much of David Yazbek’s contribution being removed after Andrew Lloyd Webber saw it performed on stage. In November 2007 the production toured Stockholm, Gothenburg, Oslo and Helsinki, using an expanded set designed for use in stadium venues. The last performance was on March 2008, in Plymouth. New Zealand Tour (2009) – Following the end of the UK & Scandinavian tours, the expanded stadium set and properties were shipped to New Zealand to form a new production. Dates in Christchurch, Wellington and Auckland have been confirmed for July/August 2009. The main components of the set were a series of tracks which extended out into the stalls, fully enclosing a block of seating, and at a higher level around the edge of the grand circle. Extensive alterations were made to the structure of the theatre to accommodate these elements. The audience were thrilled to have actors racing past them on roller skates all around the auditorium. There was also an early example of stage automation, with a large flown bridge which rotated to connect various tracks and parts of the set together. In addition there were mechanical safety barriers which rose around the tracks in the stalls of the auditorium at ‘race time’. All of the music for the show was performed by a live band under the stage. The stage extended out over the orchestra pit. Hersey brought the feeling of a rock concert to the West End stage with his groundbreaking high energy design. The Napier-designed bridge featured a rig underneath it to supplement the main rig when it was flown out. The moving lights on the 1984 version of the show were controlled from an Apple 2E computer. The lighting design (along with the running order and content of the show) was revised in London in 1992 to refresh it for a new generation. The UK tour in 2005 used 3D projection (as did the previous US tour). The high energy races were pre-filmed, and relayed via 4 digital projectors to a back projection screen flown downstage. More. See also the LSI article above. The $8 million budget and $2.5 million set transformed the Gershwin Theatre in 1987. More information about the Broadway show. The Starlighthalle venue in Bochum, Germany was built specially to incorporate racetracks and a large stage area to accommodate this show, in less than a year. Between June 1988 and June 2008 more than 12 million people saw the production. The team behind Starlight Express, now in its 17th year at London’s Apollo Victoria Theatre, have decided to update the show’s lighting rig. After adding High End Intellabeams back in 1993, lighting designer David Hersey and the show’s original production electrician, Howard Eaton, returned this year to update the lighting rig once again. This time they opted to replace the Intellabeams with equipment from Martin Professional. The Moving Light Company were called upon to supply the production with 24 Martin MAC 500s and three of the new MAC 2000 units. In addition, they supplied two DHA Pitching Digital Light Curtains, which provide a dramatic new way of lighting the spectacular bridge which forms the centrepiece of John Napier’s set design. The changes to the lighting rig were made in a tight 10-day period when the production closed temporarily to allow the auditorium to be re-carpeted and re-seated, during which time Eaton and his team also took the opportunity to upgrade the dimmers and lighting control system, with the rig now controlled by the Rosco-ET Horizon lighting controller. Horizon programming was in the hands of Robert Bell, one of the creators of the WYSIWYG lighting visualisation software and now Horizon’s product manager, who worked with David Hersey and Howard Eaton to relight the show using the new equipment in a very hectic final three days.